@NattyGov: In your car. With friends. At 3am. While sharing a litre of Frulati. @WhoAreEthan21: With your hands, anytime, anywhere! Fatiema Baradien Khan: After a night out painting the town red – it’s an epic way to end an evening. Grant Boere Meyer: On a Saturday morning with Cabana peach juice. @BerrySolo: When you’re really hungry, especially on a cold day, with Cabana or Tropika juice. Jannie Kirsten: On the rocks at sunset, preferably in Mouille Point. @akeena_ognimod: With an ice-cold Coke! Drawcard: This family run business has been plating up the type of Gatsbies that create repeat customers for years. Nestled in the colourful and quirky ‘hood of Bo-Kaap, this is the perfect place to dig into a larger-than-life loaf with all the trimmings. This is a Halaal establishment, so there is no alcohol allowed, but they do offer a homemade falooda made traditionally with milk. rose water, almonds and ice crream to cool the burn. Drawcard: A personal touch is what sets this long-time, family-run institution apart. That, and the fact that the small store sells an incredibly diverse range of Gatsbies, from a Goulash Full House to a Russian Sausage and a Cheese and Perinaise mix. 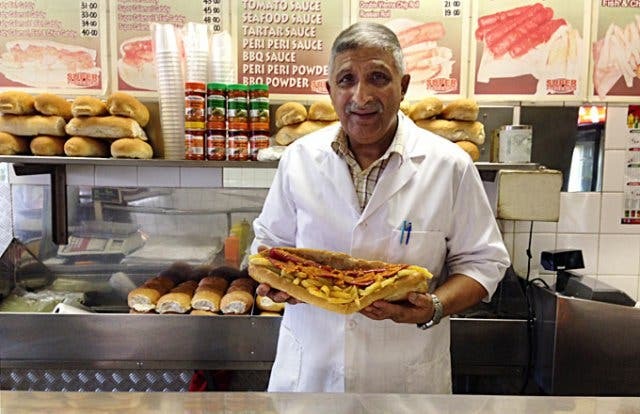 Drawcard:This fish and chips shop in Athlone is owned and run by Rashaad Pandy, the inventor of the original Gatsby, so you can expect authentic subs here. 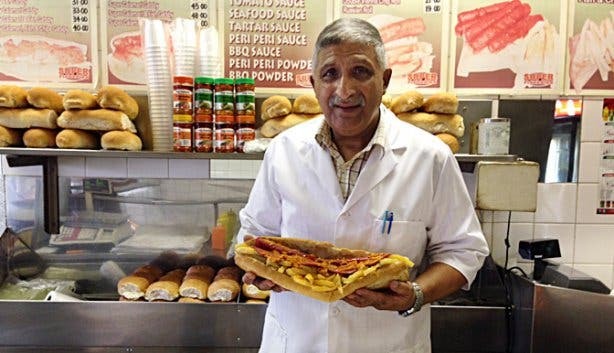 The store focuses on fish and calamari-filled super sandwiches, but it still sells Rashaad’s first combo: polony, chips and achar. 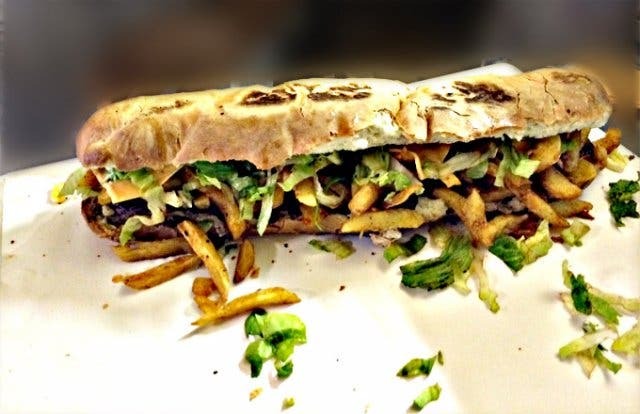 Drawcard:Founded in 1973, this family-run takeaway store is the only one in Cape Town that makes a flame-grilled rump steak Gatsby, and it’s also particularly popular for its basting sauce, which is made from olive oil, honey and the freshest ingredients. 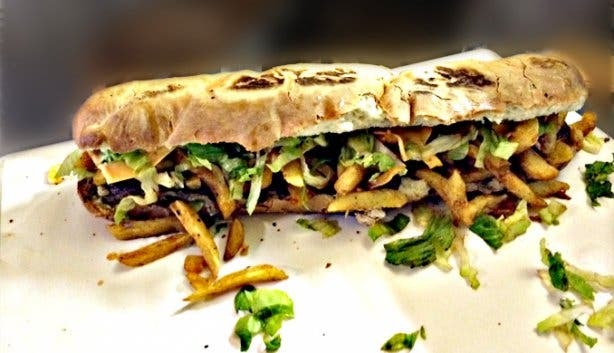 Drawcard:Not only is this super sandwich hotspot very conveniently located (there are two stores in the heart of the CBD), but it also makes a killer (and perfectly spiced) Full House Steak Gatsby – think masala steak, eggs, chips, cheese, braised onion and salad. Drawcard:Claiming to make “the best Gatsbies in town”, this little takeaway joint in Cape Town’s Ottery focuses on quality ingredients and irresistible flavour combinations.